The spring season is upon us and at Arlington House it is considered one of the most beautiful times of the year. With the new leaves on the trees and shrubs surrounding the estate changing the landscape, one can envision both the Custis and Lee families celebrating the start of a new planting season as the weather turns warmer. As a key member of the Arlington House Foundation’s “constituency of care”, we wish to bring you up-to-date with the latest historical restoration efforts for this great American treasure. We are proud to announce the official start, during the month of March, of the complete restoration of Arlington House. This will be a lengthy process as the mansion will undergo a top to bottom process to bring Arlington House back to its 1860 appearance. Estimates for completion of all repairs and updates are between 12 and 18 months. While this massive restoration is happening to this famous historic site, we have a major project, currently not funded, to discuss with you. For many years we have been working to broaden our interpretation to encompass more stories and details regarding the lives and experiences of enslaved and free African Americans who lived, and worked on the Arlington plantation. The park would like to begin a major project that would include the creation of new permanent exhibits and interpretative waysides. Once completed, these will tell the complete story of the African Americans living on the plantation as never before. To deepen visitor understanding of the meanings and at the same time, strengthen our institutional awareness of the dynamic living components of that history, we would like to enlist and engage the descendent community. Present in the draft of a new exhibit plan, is the mechanism to give voice to the living descendants of the enslaved. Our desire is to partner with the living descendants of the enslaved that will allow them a greater voice in the presentation of their own histories. Once completed, the rotating exhibits will trace the human stories from enslavement to modern life and show the survival and triumph of those who had to struggle for so long. Needless to say, while we have much to be proud of with the beginning of the major restoration project starting on the mansion, as you can see, we still have projects to be accomplished and would welcome your support in moving this particular project forward. 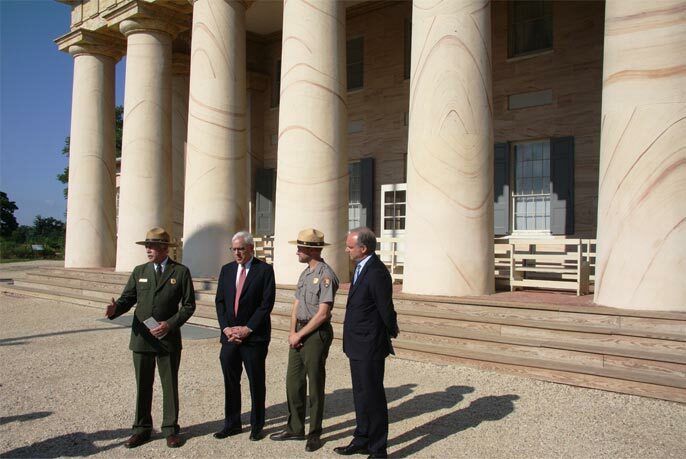 Your donations become even more important to the mansion during this time when Federal cutbacks to the Park Service are delaying many critical restoration projects. A list of all our approved projects is located at our web site at www.arlingtonhouse.org. Your donations may be made on-line at our website or by check mailed directly to our address, “Arlington House Foundation”, PO Box 3689, McLean, VA 22103. Once again, thank you for your generous support and for your ongoing commitment to our restoration campaign for Arlington House and the surrounding 19 acres. What an Incredible Fireworks, Music and Dinner Extravaganza! Yes, it was hot. But the breeze off the river was lovely and the camaraderie, music, delicious food and spectacular fireworks combined for an unforgettable evening. My favorite part was the perfect timing of the band to the grand finale of the fireworks, with the National Anthem playing in perfect sequence to the exploding lights. That, and the deviled eggs! A special thank to the many volunteers who gave tours dressed in period--yes that is right, wool! --- garb throughout the evening. The house restoration is coming along and it was great to share our progress - -and our goals! The Fourth of July Fireworks Fundraiser is almost here! We are so excited to have the cooperation of the U.S. Army and the National Park Service to permit our exclusive use of Arlington House for watching fireworks on the National Mall....from the moment you are cleared to drive up through the gates at Memorial Drive, this becomes the most magical DC event you can imagine.